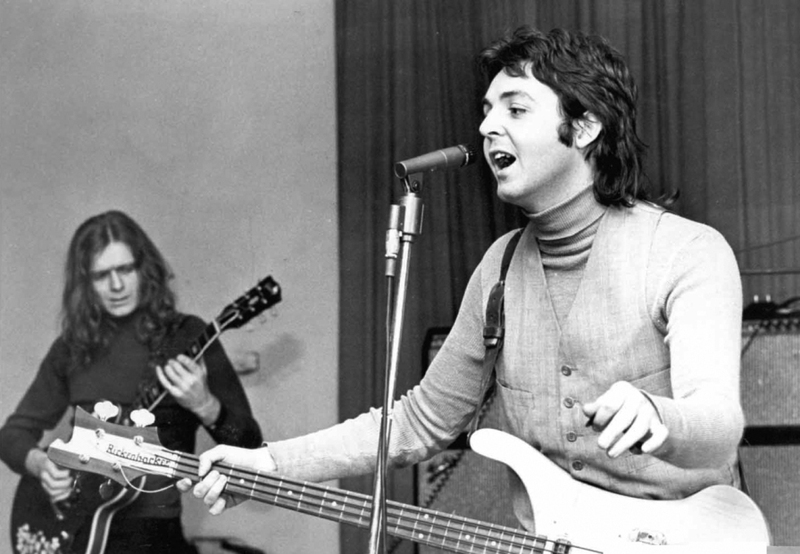 As you all know no doubt, Paul did play a couple live shows in universities in England. The picture on the cover of this newsletter was taken at the Nottingham concert and appeared in Melody Maker. "It was a spur of the moment thing, Paul said to MM. One of the group said he had played at Nottingham University and liked it so that's where we ended up. We wanted to try things "live." MM also said, "It was vintage McCartney, who on occasions looked as tho he had gone straight to early Beatle days as minus beard and with his hair cut short, he again sailed thru straight rock numbers such as 'Lucille' and one or two Presley favorites. Judging by the way both the audiences appreciated the performances, the group looks a winner 'live.'" New Musical Express said about the concert: "For those who grew up in the shadow of the Beatles it was hard to put into words the feeling of sheer excitement generated by seeing the man who represented the very heart of what they stood for standing there on stage, singing 'Lucille.'" McCartney has not performed on stage for five years and it was plain to see he felt good to be back. It was shown from the very first number. Here was a damn fine fine little band, who, even by other standards would be very highly rated. "At one this number (My Love) around reminiscences of his more well-known material (Let it Be springs to mind.) Seated at the piano, he was back in the days of "Hey Jude;" a little boy lost singing about his love simply without frills. It was a concert none of us will ever forget. The following was sent in by Pat D. Pat's friend attended the concert by Wings in Lancaster University, and here's a little of what she said about it. "They let us in at 9pm and my friends and I wormed our way right to the front of the stage. Everybody was sitting on the floor and there was a lot of space just before the stage. Then at about five after nine he walked on stage. He wore a fair isle pullover, a pink checked shirt, which looked tangerine under the light and grey trousers. Linda wore a wide-brimmed hat and shapeless blue and white midi-dress. After the interval when they came out into the hall again and posed just for me.